"Roman's Road", the new instrumental guitar single from Dave's forthcoming release, is inspired by the plight of his nephew Roman, who was born four months premature. Proceeds from the single to benefit the March of Dimes. Do you like babies, giving to charity, and instrumental rock guitar?...And Let's face it; who doesn't?! Well, now these three elements have been melded together by guitarist Dave Paris. 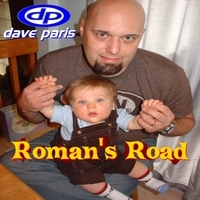 "Roman's Road", the new single from Dave's forthcoming release, is inspired by the plight of his nephew Roman, who was born four months premature. The video features home movies and clips of Roman's earliest days in the hospital, to his playful moments growing up with his family. For the video, Dave also wanted pretty, young dancers, but the only ones available within the budget were his nieces! The song, which is available for download at CDBaby, iTunes, Amazon, and other digital outlets, is just like Roman: fast, peppy, and non-stop. With the single being released on Roman's birthday - January 3, proceeds from the song will benefit the March of Dimes. Watch the video, download the song, and get more info at Dave Paris' official site - daveparis.com. Dave does it again with a hard-hitting, fast-moving song. Great guitar playing and layers of good, heavy riffs. You can't dance to it, but fun for air guitar.